The faraway king of all the birds, the Simurgh, lets fall a magnificent feather in the center of China: tired of their age-old anarchy, the birds resolve to go in search of him. They know that their king’s name means thirty birds; they know his palace is located on the Kaf, the circular mountain that surrounds the earth. ☛ Selected Non-Fictions by Jorge Luis Borges, “Nine Dantesque Essays: The Simurgh and the Eagle”, ed. by Eliot Weinberger, trans. by Esther Allen, Suzanne Jill Levine, and Eliot Weinberger, New York: Viking Penguin,  1999, p. 296. In this excerpt, Borges offers a summary of the plot at the heart of the epic, 4,500-line Persian poem Mantiq al-tayr (alternatively The Conference of the Birds, Speech of the Birds, Language of the Birds, The Concourse of the Birds, Bird Parliament). The poem was written around 1200 by the Sufi poet Farid ud-Din Attar. It is often interpreted as an allegory of the quest for God. In Borges’s interpretation, it becomes an expression of pantheism. It could be said to be concerned with neoplatonic ideas similar to those at the foundation of Thomas Aquinas’s doctrine of participation: how different, finite beings can participate in one single, infinite Being. The fact that Borges also quotes from Plotinus in his essay should come as no surprise. And in its vivid rays they shone as one. The pilgrims go forth in search of an unknown goal; this goal, which will be revealed only at the end, must arouse wonder and not be or appear to be merely added on. The author finds his way out of this difficulty with classical elegance; adroitly, the searchers are what they seek. In identical fashion, David is the secret protagonist of the story told him by Nathan (II Samuel 12); in identical fashion, De Quincey has proposed that the individual man Oedipus, and not man in general, is the profound solution to the riddle of the Theban Sphinx. In an interesting essay, José Darío Martínez analyses how the figure of this “identity […] between the seeker and that which is sought” will come to play an important role in Borges’s production (see “Borges and Farid ud-Din Attar: The Influence of The Conference of the Birds on the Later Prose of Jorge Luis Borges”). If the idea of, or the desire for community is substituted to the Simurgh, or to God (in both cases the substitution if not far fetched), then Borges’s final note broadens to encompass a political dimension as well. In this sense, it could be said to be a possible answer to our current coexistential predicament: “we” are what we are looking for. Elsewhere, I have suggested in a similar fashion that “living together is what happens when we’re collectively trying to figure out how to do it” (see Some thoughts on the 2012 Quebec student protests). Finally, it is worth noting that a certain understanding of communication could stand as a name for this quest (communication as exchange, for example). We communicate through and by this quest, as a way to find ourselves. If we were to realize that “we” is what we are looking for, the “conference” (or the language, or the concourse, or the parliament) would dissolved: we would ceased to speak and silence would reigned. Few manuscripts of the Mantiq al-tayr remain, and less than ten have illustrations (see The Digital Walters). One such manuscript is conserved at the Metropolitan Museum of Art: The Mantiq al–Tayr of 1487. Of its original nine illustrations, eight remain, and of those eight only one –Folio 11r– is concerned with the main story, that is with birds. A detail of this image is reproduced below. The British Library hosts another manuscript –Add MS 7735– which has been digitised and is fully available online (as part of an ongoing project founded in part by the Iran Heritage Foundation). 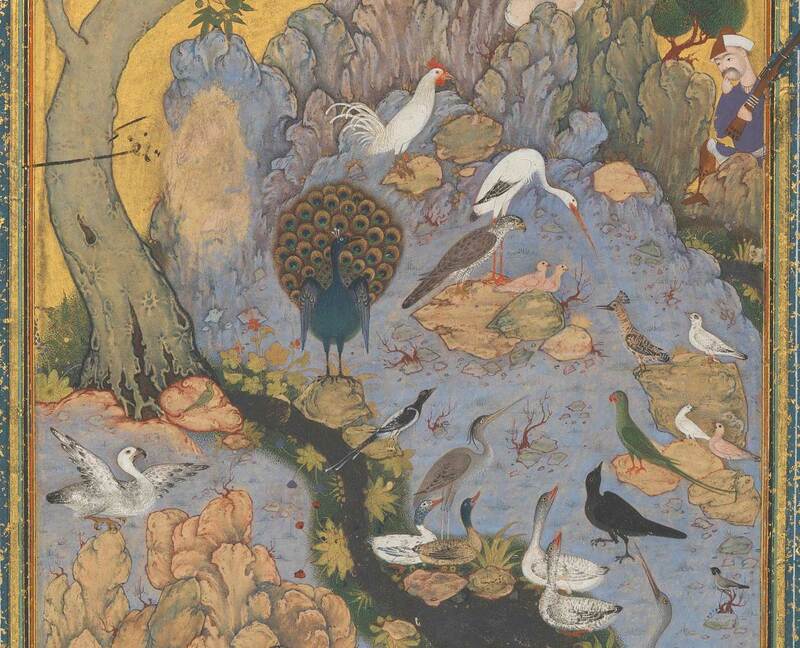 The British Library blog also has a very instructive four-part discussion on the value and meaning of the manuscript in general, and of some of its illustrations in particular: “‘The Speech of the Birds’: an illustrated Persian manuscript” Part 1, 2, 3, and 4. Manṭiq al-Ṭayr by ʻAṭṭār, Farīd al-Dīn, d. ca. 1230. British Library, Add MS 7735, folio 2r. A digitized copy of another manuscript, this time belonging to the Universty of Michigan, is availble online at Hathi Trust Digital Library. This manuscript is dated from late 15th or 16th century. Yet another manuscript –Vollers 0921t– was digitized as part of an ongoing project pertaining to the Islamic Manuscript collection of the Leipzig University Library.